Ten Years of Rocking Silence! Now on its 10th edition “The International Silent Film Festival in Manila,” the first of its kind in South-East Asia, will feature films from nine (9) countries. The Philippine-Italian Association, the Japan Foundation Manila, Goethe-Institut Philippinen, the Film Development Council of the Philippines, Instituto Cervantes, the British Council, and the Embassies of United States of America, France and Austria, are extremely proud to present an enhanced program for the 10th edition of the International Silent Film Festival in Manila that will take place on August 25-28, 2016 at the Shang Cineplex, Shangri-La Plaza, Mandaluyong City. To celebrate this important festival milestone, the participating countries have decided to enrich the program with lectures and a round table discussion on Silent Cinema as well as an exhibit that will open on August 16 at the Grand Atrium of Shangri-La Plaza, which will illustrate the 10-year journey of this unique festival. As customary, newcomers have the honor of opening the festival: on August 25th at 7:30PM, the British Council will present Play On! Silent Shakespeare, a new compilation of Silent Shakespeare shorts drawn from the British National Film and Television Archive. Among the highlights will be King John (UK, 1899), the world’s earliest surviving Shakespeare adaptation and a visit of Shakespeare’s birthplace, Stratford-upon-Avon, as seen through the eyes of filmmakers in the 1920s. The band Tago Jazz Collective will accompany these films with a live performance. On August 26th, at 05:30PM, the Festival will feature the Philippines’ A Short Film About the Indio National with live music from Oh, Flamingo!, and, at 08:00PM, the Italian adventurous film Maciste all'inferno (Maciste in Hell), introduced by a lecture of film expert Nick Deocampo, and accompanied by a musical performance of Ely Buendia. On the succeeding day, August 27th, at 01:30PM in the Grand Atrium, a Round Table will see two big film experts, from Japan and the Philippines, Mr. Hidenori Okada and Prof. Deocampo, contextualize the Silent Film in the History of Cinema. Spain will open the screenings at 03:00PM with La revoltosa, a 1924 film version of the popular Spanish zarzuela. At 05:30PM, Japan will follow with the showing of Muteki (The Foghorn) introduced by a lecture of Japanese film expert Mr. Okada, the film will be scored by Makiling Band. The day will be closed by USA’s For Heaven’s Sake, with musical accompaniment from Brass Pas Pas Pas Pas, at 08:00PM. Culminating the film festival, on August 28th, are France’s two short films Le pied de mouton (Lef of Lam) and Le petit poucet (Tom Thumb), with music composed and arranged by Felipe A. Latonio, Jr., 03:00PM, followed by Austria’s romantic operetta Der Balletterzherzog which will be set to music by Basti Artadi, 05:30PM, and Germany’s Der letzte Mann (The Last Man) supported by the music of Up Dharma Down, 08:00PM. 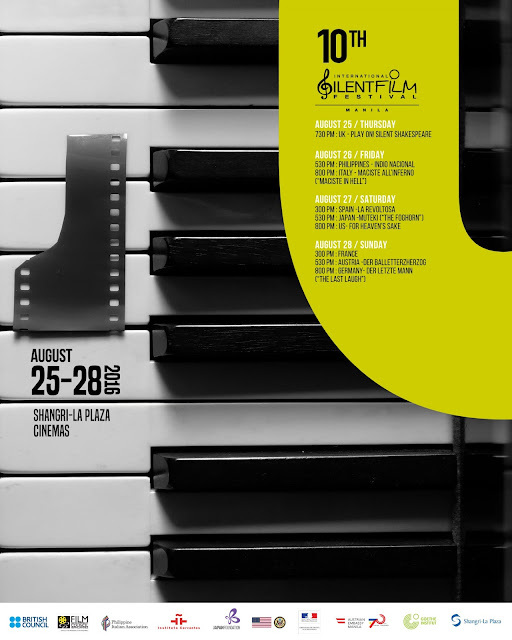 This 10th International Silent Film Festival is made possible thanks to our main partner Shangri-La Plaza, the National Film Center of The Museum of Modern Art Tokyo and Shochiku Co., Ltd., the Embassies of Italy and Spain, Filmoteca de Espana, Institut Francais, and EUNIC Philippines.